How to do a Cheap and Easy Bathroom Update ANYONE can do! she wanted to get done around the house while he was gone. was always something she wanted to change. I headed over to her house at about 9pm and we got started! (which was a new sprayer that I just got, but I did not clean it out properly, so I ruined it.. BIG mistake..
it was a BIG waste of time! We ended up hand painting the vanity and it turned out great! We started with a standard builders vanity. 1. Sand down the vanity! 3. Once you clean every thing up, start to tape off the area and put paper down on the floor. 4. Now its time for paint… we picked a PERFECT grey color.. somewhere in blogland someone said this was a great color.. so without knowing what it would look like we got the number and picked up the paint… I LOVE IT!!!! but we are going to add a sealer so it will be okay. We used only about a quart of paint. I would recommend buying a gallon there is nothing worse then running out of paint, and then you will have extra for touch ups! 5. We hand brushed the whole thing.. it probably took us about an hour and a half or so for us to paint the outside and inside of the vanity. Then we cleaned up and we were done! It was such a quick and easy project and it made a Big, BIG difference! 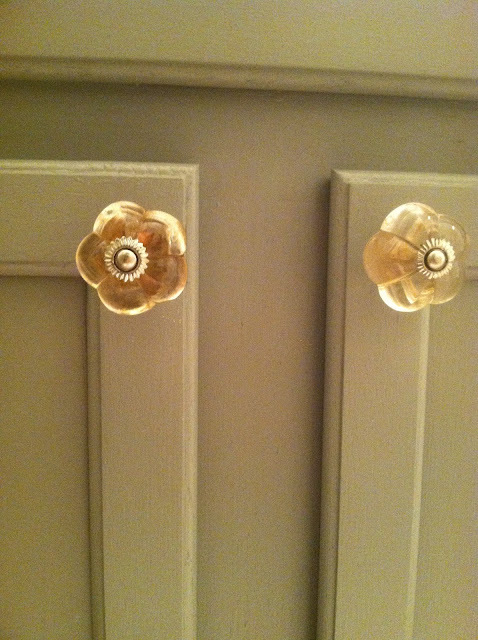 Scarlett added crystal knobs from Hobby Lobby and her new curtain from Anthropologie. 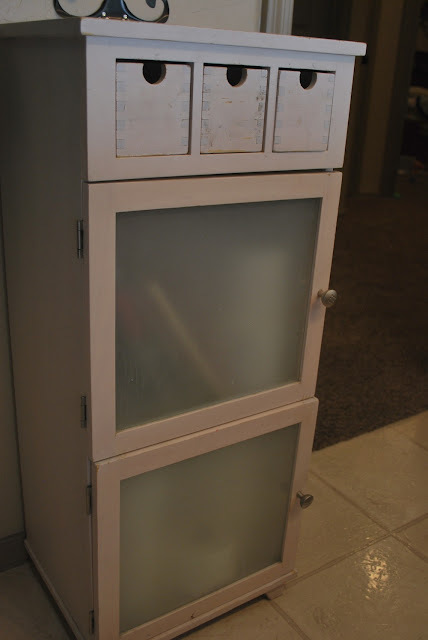 The last thing for the bathroom redo was to spray paint a little cabinet that Scarlett had. It was a old piece from my moms house.. it was a dirty cream color. We spray painted it a light pink color. Here are the AFTER shots. Much better! 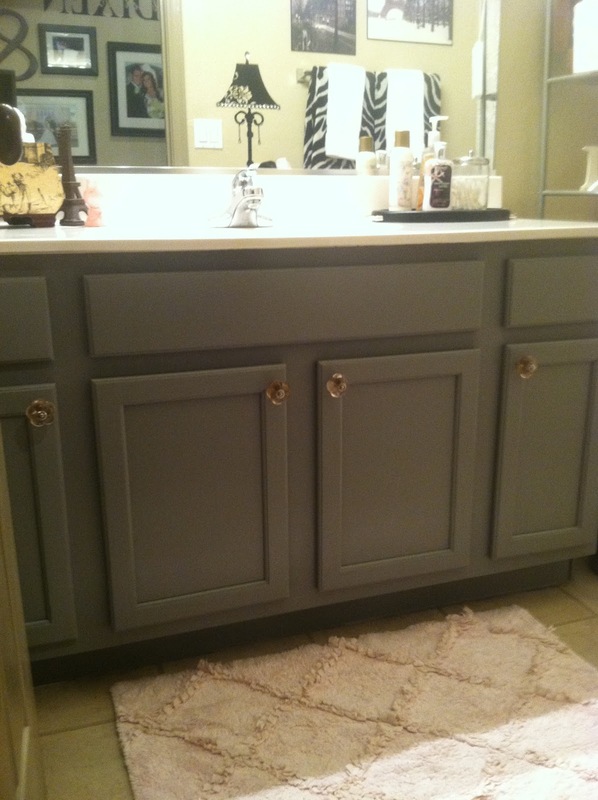 What do you think about the painted vanity and little pink cabinet? Is this project something you would do? I just painted my bathroom vanity black and love it! Such a quick, easy and cheap update! Looks great in gray, that’s what I plan on doing my master bathroom vanity it! Very nice. I love the color you chose for the vanity. This is so funny! I just finished (about three weeks ago) painting my daughters bathroom. We did a very similar grey on the cabinets with glass knobs (mine are turquoise instead of pink) and that exact same pink target rug! For the shower curtain, we did a turquoise floral one from target and added gray ruffles to the bottom of it to lengthen it. I guess great minds think alike! Oh, and I have yet to decorate the room so I’ll definitely use your as an inspiration. Thanks! Ok What is that perfect grey color? I am going to see if I can add a pinch of warmth and a little black to tweak the color. Then painting the vanity black. They totally tinted in wrong then, ya i was way bummed. What great did Savannah use? I’m going to laugh if it’s the same kind. Stupid Walmart paint guy! I need to stick to Homedepot. I meant what PAINT COLOR Did Savannah use? I see the number there, did it have a name? The vanity looks so much better in gray, and the crystal knobs are perfect! OH WOW! That turned out wonderful. I so need to do this!!!! I am dying to paint my bathroom cabinet. Love this! What type of sealer would you suggest for this? Lovely idea! just with a little bit of painting we can change the hole design! I’ve painted my bathroom tiles, and also changed the toilet and the faucets, and the results had been amazing, like a completely new bathroom.